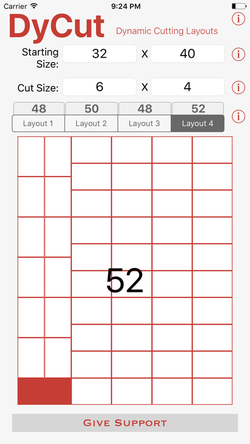 DyCut calculates 4 dynamic layouts to maximize your materials. Getting the most out of your raw material helps you save money, improve output, and reduce waste. DyCut provides value to professional applications such as, manufacturing, carpentry, printing, framing, etc.. DyCut also comes in handy for personal and hobby pursuits like scrapbooking, card making, and quilting, and more. Our goal at Courtney & Company is to provide you with applications to make your life easier. We ask, as DyCut saves you money you consider donating a portion of your savings to support our development efforts. Enter the size you want cut.